Tip O'Neill — and much of the civilized world since — told us that, "All politics is local." In 'Frank,' Barney Frank offers a crisper interpretation. Politics, we learn, is personal. The entire process, at least here in the US, is based on one-on-one relationships, handshake-less handshakes and knowing glances. 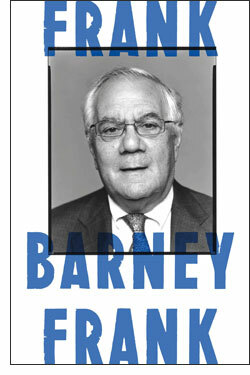 In his memoir, Barney Frank tells us his story, but he makes it clear from the first sentence that he and this book, is all about politics — and people. First and foremost, expect to find 'Frank' a pretty damn funny book about pretty damn serious subjects, notably, the struggles of left-leaning politicians over the last half-century. You will note (again, from that first sentence), that Barney Frank has a great, wry, dry prose voice. No matter what he's talking about, there's a bit of a tilt in it, not the left tilt you're expecting, but rather the world-weary, knowing spin of the constitutionally satiric. The upshot is that from beginning to end, 'Frank' is fun to read. Early on, Frank makes it clear that he's offering a pretty strict chronology of his life from age 14 to the current day. The plot arc, so to speak, is that of a bildungsroman, Frank's coming of age story as a young man who realized he had two things working against both a happy life and one another. That is to say, he realized he was gay and he liked politics. He kept his sexuality to himself for much of his early political life as he tells it here, but always crusaded for gay rights. It's a pretty straightforward compromise, and as it plays out, a pretty good call. The book tells his life story in order, and we hop back an forth on the issues as they presented themselves to him in his career. Frank's underlying theme, beyond the issues in specific, is the interpersonal nature of politics, here in America. While Frank is a master of parliamentary rules and practice., again and again he comes back to the idea that our Congress at both state and national levels, is a huge gaggle of equals who have to learn to bargain with and trust one another. This is paired with his incrementalist approach, which is to say that he favors evolution over revolution. He's happy to give his own party a hard time in this regard. He'd rather get half a loaf than stand outside with a placard in hand. He even goes so far as to praise the NRA, not for its beliefs but rather its ability to get out those who share them to the voting booths. If you're expecting rancid revelations or raw self-flagellation, for get it. Frank's not sorry for being himself, though he admits to mistakes when he's made them. What you can expect is a mordantly witty, always engaging story of our nation in the last fifty years, as told by a man who helped craft more than a few important laws. The book does conclude with Frank finally finding happiness outside of politics, in his marriage to his husband, Jim Ready. It's a welcome finish to the book, which itself will make most readers hope that Frank's not yet finished with politics. By this time, readers will feel that they know him and politics itself personally — and that he lives up to both his name and the title of the book.